Add a touch of luxury to your look with this ladies' watch from Rotary. Featuring an elegant mother of pearl dial set with glittering crystals, this chic stainless steel watch is finished with a bracelet strap and stone set case for added sparkle. Rotary Watches offer classic, quality Swiss watches at affordable prices. 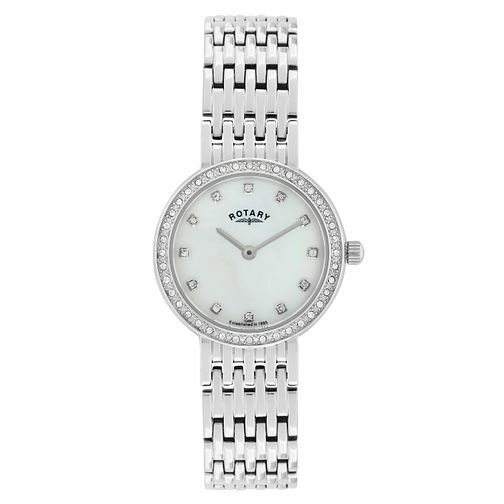 Rotary Ladies' Mother of Pearl Stainless Steel Watch is rated 4.5 out of 5 by 8. Rated 5 out of 5 by Anonymous from Very elegant! Gorgeous, elegant watch! Bought by my husband for my Christmas and I love it! Rated 5 out of 5 by Anonymous from I recommend this product. This product has great. High recommend. Nice watch.